Valve is once again taking on fake games plaguing Steam, this time focusing on achievements. In a leaked post to the private developer forums, Valve announced that games will now be subject to confidence constraints that will limit how many achievements a game can have and how those achievements affect your account, until the game is validated as being an actual product that people are buying and playing. The post notes that, until a game is validated as being genuine, it will be limited to 100 achievements and progress will not be visible, nor will it count toward global achievement numbers. Achievement games have become more prevalent on Steam due to Valve’s lax restriction and quality control on products, with an entire genre forming around games that offer thousands of achievements with no real underlying game, generally simply requiring the game to be launched and idling to generate achievements. This move is very similar to one that Valve took against trading cards, where Valve placed limits on which games would be eligible for the marketable, tradeable cards. 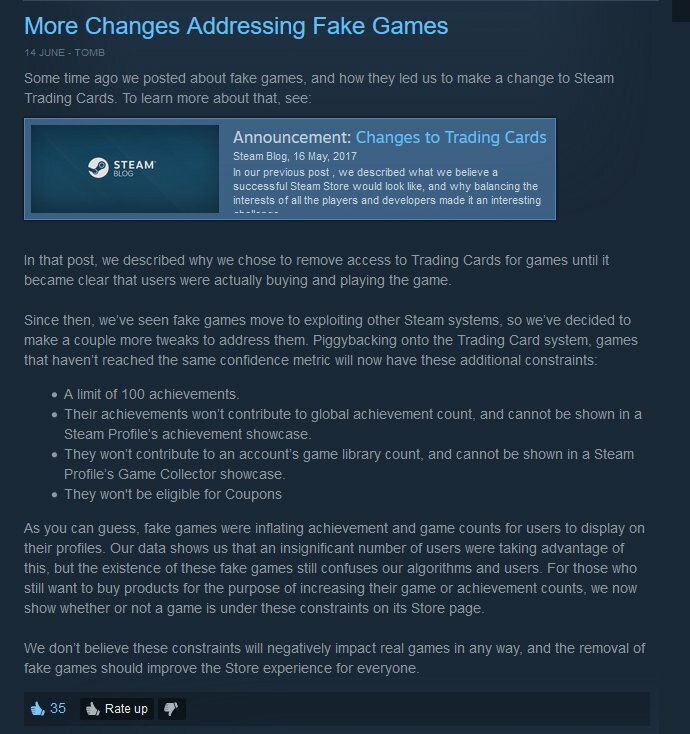 It is important to note that unlike trading cards, where an entire black market of mostly Russian bots formed to farm games developed purely to profit off of fraudulent card sales, that achievements are absolutely worthless in Steam other than for decoration and ego purposes.